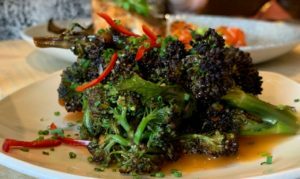 I am always seeking out new gluten free restaurants in Edinburgh, so was pleased to have the chance to test out social enterprise, Vesta on Queensferry Street. Offering good quality food. but with a conscience, Vesta was a great choice for a midweek lunch. The server brought me a whole gluten free menu, which was packed full of choice including a surprising number of the mains. I chose a really good sea bass with aubergine and a side order of bang bang brocolli – a brilliant choice! 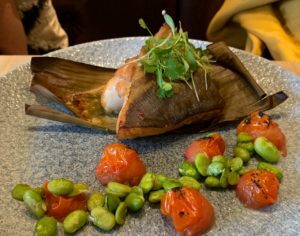 My fellow diner – a gluten eater- went for a huge piece of cod with edamame beans. Succulent and light, yet filling, these are good options for lunch without being too heavy. Other options include burgers, meat dishes and a pretty extensive range of vegan options too. A set lunch would have been great value too. If you are going for a full meal, then there are also plenty of GF starters and puddings, plus other dietary issues are well catered for. The service was efficient and friendly, the food was delicious and a couple of pots of peppermint tea finished things off nicely. Vesta is a good place to go for GF and for good quality food with a heart – winners all round.